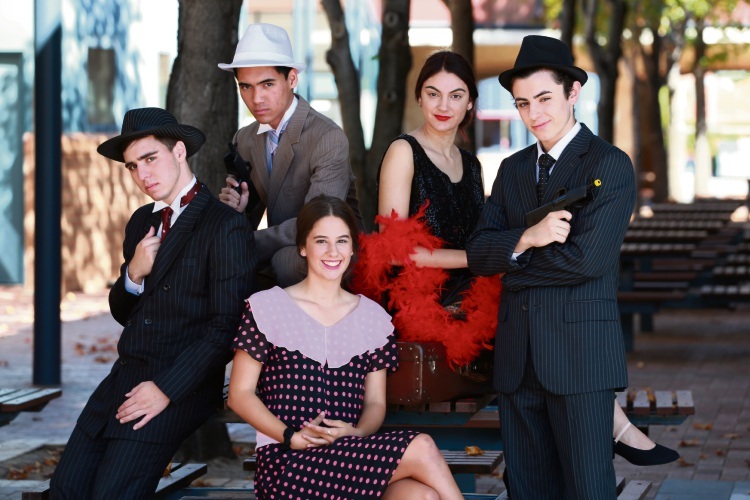 ABOUT 150 Chisholm Catholic College students are looking to share “a little love” through its upcoming production, Bugsy Malone. The college will be holding four shows from May 9-12. Bugsy Malone was a film released in the late ‘70s starring Jodie Foster and Scott Baio before being made into a musical. The production is set in New York in 1929 and is based on failed boxer Bugsy Malone, who is involved in a conflict between Fat Sam and Dandy Dan’s two gangs. The love interests of the trio are Blousey, Talulah and Louella. Director Rebecca Williams said there were 80 stage performers, a 20-member orchestra and about 50 students working backstage and the front of house. Williams said the main message of the production was “if you give a little love then it all comes back to you” – a lyric from one of the songs. “It has been a fantastic journey with a really enthusiastic cast and crew who have risen to all challenges and had fun doing it,” she said. Year 11 student Patrick Volpe, who plays Malone, said the production one of the standouts among four productions he took part in, as it was his first lead role. “This year, under the guidance of our directors, we are doing everything we can to make this a show that people will remember for years to come,” he said. Fellow student Bethany Laurito, who plays Blousey, said her love for acting grew after gaining the opportunity. “This production is full of amazing memories that I will cherish forever but my favourite moment was when we just all started reading through the script,” she said. “We all face challenges along the way but there has not been any major hiccups in this production so far.